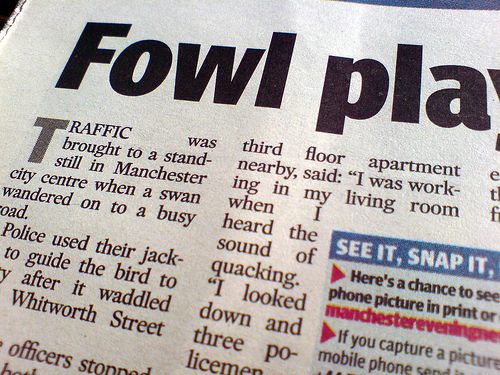 In this article about a (mute) swan that I found in a rubbish free paper that someone had left on a rain sodden table outside a Manchester bar, the interviewee claims to hear the sound of quacking outside. However, swans don’t quack on account they are swans and not ducks so someone is lying and I don’t like it one bit. Needless to say I am furious. This news is from squacco and it must be said I agree with her. Like mutton for lamb, swans for ducks simply does not work and it is an appalling idea. It raises my hackles. Or it would if I had them. Nobody serves swan anymore that I know of except for one small famous college over the pond. And it’s my feeling they do it mostly for the feathers. If you’re looking for something motivatingly healthy to read this weekend about food, Clean Eating is out – it is the second issue of this new magazine, and it is very good. Ellie Krieger (who we mentioned earlier this week) is a contributor. You can get a taste at their beautiful website, just click here. In two years, the northern Spanish towns of Villabilla de Burgos and Alcala de Gurrea will be running on artichokes. No kidding! According to a Reuters report, the towns plan to burn giant, 10-foot-high artichokes at their twin power stations to convert the thorny vegetables to electricity. Back on Earth As We Know It, Men’s Health with their ongoing compendium of “Eat This Not That” offers yet another list up to the world: 125 Best Supermarket Foods. Ladies and gentlemen, rev your appetites—and steer your shopping carts toward the delicious staples of a healthy diet. We scoured the grocery aisles and chose the most reliable basics and the best secret ingredients that will improve your diet and take your cooking up a notch—all in one trip to the supermarket! God it sounds exciting! Rev rev. Sustainability. It’s up there with motherhood and apple pie, who could be against something so eminently desirable. Yet the fact is that we have no analysis of what is sustainable and what is not. 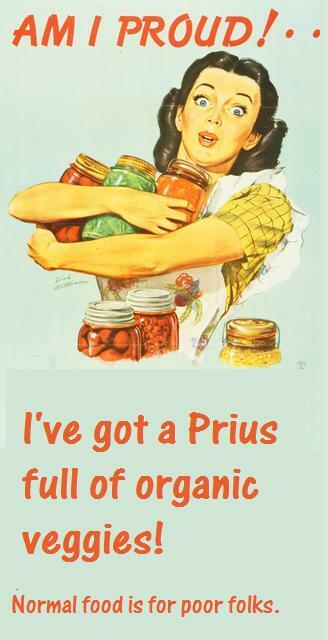 Assuming that if it’s small and organic it’s sustainable won’t do. Big issues in food history. Does America have a cuisine? What is a cuisine anyway? What are regional cuisines? Is it possible to eat locally and why would anyone want to? What about servants? Big issue in food politics. Basically I think that for all its problems, there’s never been safer, tastier food. So why is that? What are we doing to keep it so? What about all the naysayers and their doom and gloom? If you’re still hungry just click on the YouTube video below. It’s possible you may never be hungry again. “Cooking for Solutions”. “Fish Without a Doubt”. Strong words full of action, seasoned with vital rhetoric. The first names a conference at the Monterey Bay Aquarium, the second a newly-released book. Sustainability is key, and never more so than in this very moment – in terms of the fish and seafood so many of us love to have on our plates. We eat fish for taste, we eat fish for health, we eat fish for celebration too – and often the varieties we choose have names and faces as recognizable as Kobe beef or foie gras. The difference between Kobe, foie and fish is huge though – for both Kobe and foie are products farmed by man – not wild things as connected to nature as anything can be – with the inevitable chaos that being connected to nature has attached as part and parcel. Add the unfettered or fettered-in-bits-and-pieces effect of humanity upon the natural world and it seems that fish are in a pickle. Therefore so are we, and in more ways than one. We’re losing options. Options for delicious things to eat and options even for affordability in many cases. The gulf widens between those who can and those who can not, as in so many things right now. Even those who sit in the catbird seat without need of concern about cost may find that eventually what they want to buy just simply won’t be there. The food was lavish — proof that sustainability need not mean self-denial. At the reception, we were served oysters with a mignonette sauce, pasta with asparagus, little bits of beef served with a sort of Bordelaise sauce on top of some kind of blini or pancake, and sushi made from sustainable tuna from Hawaii. I haven’t had tuna sushi in years because it’s so hard to get sushi made from sustainable tuna. I greedily ate three pieces. I have missed the satiny texture of raw tuna, and the way that the sweet heat of the preserved ginger sets off the tuna’s dark, meaty taste. I have a little antennae that perks up when hearing the key menu words listed above. “Foodie” it whispers. “Foodie”. It’s not the lovely side of foodie that my antennae is reminding me of, the side that lives to nurture but the alter-ego side. The side that wears fine food as fluffy feather in a big aspirational hat. To everything there is a season – and in the season for the average person who tries to eat as best they can on a daily basis, the menu above is not either usual nor attainable. It brings to mind conferences, functions, corporate dining scenarios, concepts wrapped within the chubby arms of certain food families whose availability has been fairly exclusive throughout time to the upper crust. And goodness knows that a loaf of bread is larger, much larger – than the crust alone. My antennae squiggles unhappily as it worries about the average person and how and what they will eat, as they struggle with time and money and resources, not bites of raw tuna and drips or spoonfuls of Bordelaise sauce. In Fish Without a Doubt, chef Rick Moonen, of Rick Moonen’s RM Seafood, in Las Vegas, and coauthor Roy Finamore have drafted a blueprint for minimizing hand-wringing in the store and kitchen and maximizing pleasure at the table. They address environmental and health concerns head-on, but perhaps the book’s best feature is its flexibility, which mitigates the fundamental challenge pertaining to seafood: Sometimes you simply will not be able to find the kind of fish you’re looking for (rarely a concern with chicken or beef). It takes self-assurance to cook for solutions . . . and I’m not sure, myself, that one can ever be without doubt. But the topic of sustainable seafood is worthy of thought if we want to be able to continue to taste the briny essence of oysters or the less exclusive tastes of their poorer less fashionable cousins swimming round in the big pond we perch on looking down upon it like the rulers of the Universe that perhaps (unwittingly or not) we are. 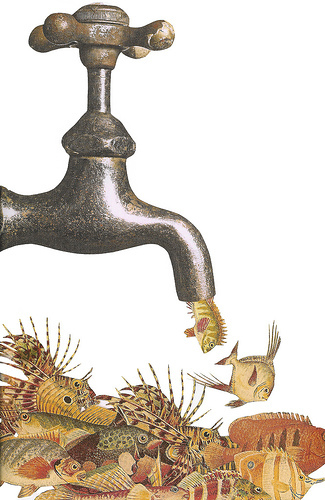 We can’t get good seafood by merely turning the tap of a faucet. Not anymore.